The freedom to set their own consciences against the demands of religious institutions. 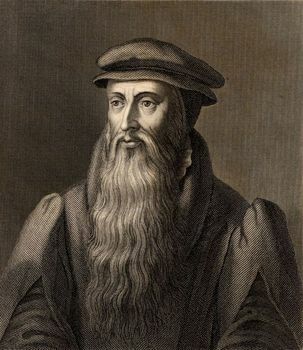 The influence of Martin Luther (in Germany) and particularly John Calvin’s theological and church reforms in Geneva (Switzerland) laid the foundations for the Scottish Reformation, led b y John Knox (his likeness pictured on the right). During the 1600s the Presbyterian system of church governance developed, and this was brought to the American colonies by some of the earliest immigrants. “Elder” is the English equivalent of the Greek New Testament word presbuteros, from which we get the word Presbyterian. In Life and Death we belong to God. Through the grace of our Lord Jesus Christ, the love of God, and the communion of the Holy Spirit, we trust in the one triune God, the Holy One of Israel, whom alone we worship and serve.